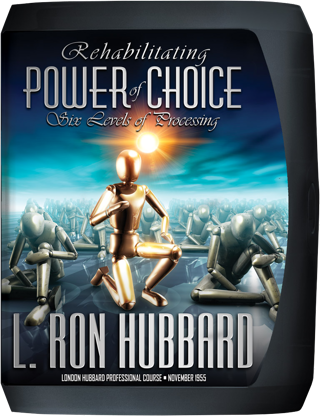 Emerging from L. Ron Hubbard’s continuing research into Six Basic Processes, Six Levels of Processing reached even more cases and at a greater level of undercut. So crucial was this technology that he decided to make it available to all auditors, delivering an intensive three-day course. First came the technology to actually start the session, for as he warned students, “One time we asked a lady for five hours what she was doing before she finally gave us a straight answer: ‘I’m being audited.’ Up to that time she was doing anything else.” Hence, the importance of Rudiments, the subject of Level One. Then, with Rudiments in, Mr. Hubbard provided detailed instruction on the rest: Level Two, Locational and Not-Know Processes; Level Three, Decisional Processing; Level Four, Opening Procedure by Duplication; Level Five, Remedy of Communication Scarcity and Level Six, Remedy of Havingness and Spotting Spots in Space. The goal was to rehabilitate the preclear’s ability to make decisions and, hence, his power of choice. 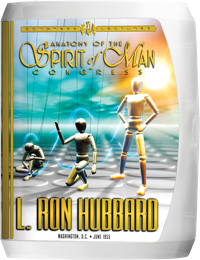 L. Ron Hubbard considered these tapes so important he exported them to Academies across the planet, while his delivery of this Professional Course would then inspire two more in the coming months. 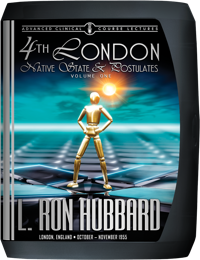 Mr. Hubbard’s return to England in late 1955 not only presaged an intensive period of research and auditor training, it confirmed and reinforced London as a city with a unique status in the history of Scientology. 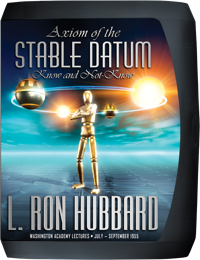 For it was here that L. Ron Hubbard had first defined the human spirit as an immortal being possessed of capabilities beyond anything previously predicted and so arrived at the axiomatic truths upon which all subsequent research and, indeed, the whole of Scientology was founded. In fact, not only Scientologists but the general public were eagerly awaiting his first visit to their shores in almost three years, and his public lectures—delivered at the Lindsey Theatre, London—rapidly sold out. Point of fact: When he started to speak, it was standing room only, with the overflow crowding the aisles. “Because we’re doing the same things that we’re doing with the Six Basic Steps except we’re just doing it a lot better, that’s all. In fact, so vital was this technology that Mr. Hubbard decided to make it available to all auditors—even those whose schedules would not permit them to attend a six-week ACC. Thus the London Hubbard Professional Course, which he convened on 8 November 1955 at the London organization’s new headquarters in Brunswick House. What those auditors would receive was an intensive study in the application of Six Levels of Processing over the next three days. “Waterloo Station”—named after the famous London railway station whose continuous bustling crowds made it an ideal environment for that type of objective process—and how it is flat when the preclear is able to not-know at will. All of which made Six Levels of Processing, Mr. Hubbard declared, “as hot as a Spanish pistol” and the Hubbard Professional Course lectures a must for auditors. In fact, the technology was of such broad importance that he exported the tapes to Academies across the planet, while his delivery of the London HPC was to inspire two more Professional Course lectures in the coming months.